Dario Smith is not one to go unnoticed. I spotted him from a block away and luckily for me, he headed in my direction. Knowing how difficult it is to find such stylish men in the East Bay, I had to approach him. 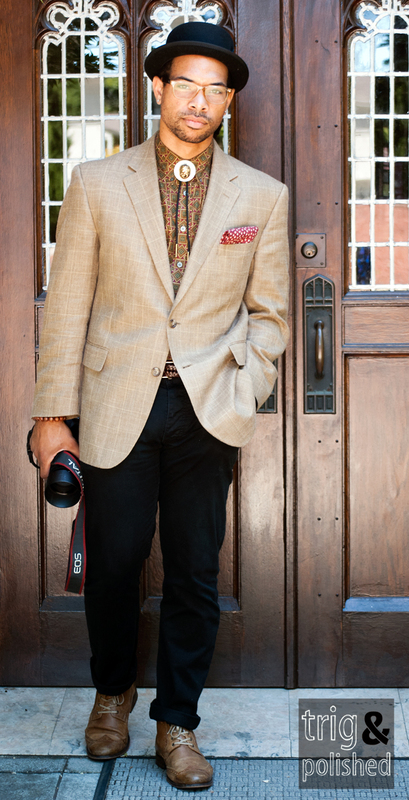 I learned that there is a reason Dario knows about menswear, he is a photographer and streetstyle blogger himself. Born and raised in Oakland, this man is doing a great job of representing the town. He’s got an eye for detail and shares the same passion for promoting bay area style. He mixes vintage and modern beautifully. I love the Bolo tie, the prescription Ray Bans and the gorgeous shoes (from Aldo). So many amazing pieces coordinated immaculately. Dario knows style! Check out his style blog. This man of many talents is also a lyricist (Spoken Word and Rap). His next performance will be Thursday, July 21, 2011 (tonight!) at The Local Artist Showcase which will be happening at Motif. His performance starts at 9PM. Show Dario some love! Nice combination in a young brother. Style and talent! What a wonderful post! Love, love, love! Keep up the good work Adriana!